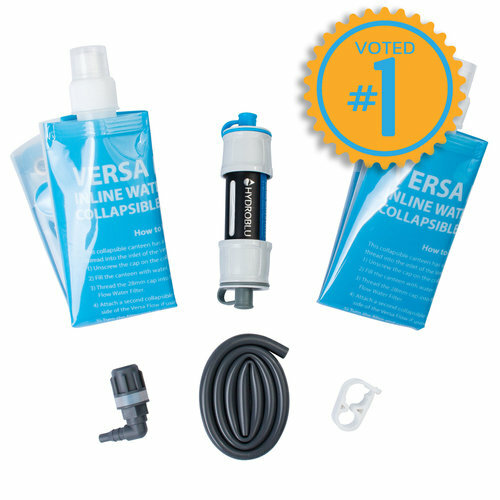 The Versa Flow Light-Weight Water Filter Package was voted the number one portable survival water filter. Click Here to read the article. The versatility of Versa Flow filter now has endless possibilities. The package includes two 64 ounce collapsible canteens, bucket adaptor, hose, and a hose clamp. 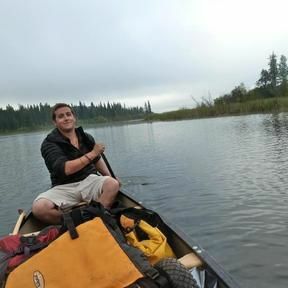 It easily adapts to your lifestyle and can be screwed onto a plastic water bottle, used inline with your hydration pack, used as a gravity system or bucket filter, or can be used as a straw so you can drink directly from the water source.ource. The Versa Flow water filter is one of the lightest and most convenient personal water filters anywhere. Weighing in at only 2 ounces and the each canteen at 1 ounce you don’t have to worry about adding extra weight your hydration pack or system. It will fit virtually anywhere. This water filter is perfect for backpacking, hiking, camping, travel, and emergency preparedness. Every filter is built to exacting standards and exceeds EPA standards for filtration. The Versa Flow has many tiny tubes called hollow fiber. Hollow fiber works through size exclusion. The hollow fiber has thousands of tiny holes (0.1 microns) that block 99.9999% of harmful bacteria, Giardia, E. coli, protozoan cysts, Cryptosporidium and more. These organisms are too large to fit through the 0.1 micron holes. By filtering the water through the outside of the tubes this dramatically increases the surface area and flow rate. We filter water through the outside of the tubes by bending the hollow fiber. This dramatically increases the surface area and flow rate of the filter while protecting the filter integrity itself. If the core of the tubes become clogged from sediment on the competitors filter you can no use the filter. The Versa Flow allows you to be able to backflush the filter, clearing out all of the particulate and increasing the lifespan of the filter. If you consistently backflush the filter you can use it almost indefinitely. This means no additional filters, cartridges, pumps, iodine drops, or batteries to ever buy again. The Versa Flow water filter does not remove chemicals or viruses from water. Generally viruses are not found in North America or in municipal water supplies around the world. Check out the Clear Flow if you are concerned about heavy metals or chemicals in your water. Lightweight and low cost, the Versa Flow should be in everyone's backpack, survival gear or travel bag.